Something huge has been spotted on the edge of uncharted space. It's miles long with a maw that could swallow a dozen star ships. It could hold a crew of tens of thousands or a crew of thousands ten miles tall. It's on a direct course for our solar system and we need you to investigate it. Such is the Big Dumb Object. It's really, really big and really, really powerful. It could be a weapon or a habitat. The Big Dumb Object is always technologically more incredible than anything the discoverers have ever seen before, but, if it's dangerous, it probably has a silly weakness like logic, antimatter, or a well placed torpedo in the right air shaft. Sometimes it's disguised as a natural phenomenon. See also That's No Moon!. Its makers may be alive in a far-off, remote region. They may have ascended to a higher plane of existence, and this object is nothing more than leftover dust in comparison to their new existence. They may have gone extinct, and this object may be the last artifact of their society. The object may be some device or even an organ used by Starfish Aliens to devour other worlds; it's possible that the object is an alien. In any case, if they were so powerful and now they're all dead, what chance do we have? Since Big Dumb Objects are so old and filled with advanced technology they are often the target of a race by several parties to unlock their secrets. In this case many Big Dumb Objects double as a MacGuffin, often a MacGuffin Location. The term "Big Dumb Object" for these things was coined by author Roz Kaveney. May overlap with Mile-Long Ship or even Planet Spaceship. Compare That's No Moon!, Standard Sci-Fi Fleet, Dyson Sphere. The makers usually qualify as Neglectful Precursors. Not to be confused with Big Dumb Body, which refers to a character who becomes a target for mind control because of his or her brute strength. The Bell in Magic User's Club, a giant alien something, invades Earth and floats off the coast of Japan with its own weather pattern. The Gauna colony from Knights of Sidonia three lightyears from the Sidonia. And to them, of course, the Sidonia itself. Outlaw Star's Galactic Leyline is a massive library left behind by an ancient and now dead race. Several different factions spend the entire series theorizing about it and looking for it, and the eponymous Cool Spaceship and accompanying Spaceship Girl were created for the purpose of finding it. Galactus of Marvel Comics fame is arguably a Big Dumb Object. Or, possibly a Big Smart Object. He just sort of wades through the galaxy eating things and creating general terror. His ship, Taa II, fits the bill being the size of our solar system and so complex that Reed Richards is unable to even guess at most of its functions. Jack Kirby's 2001 series officially introduced the black monoliths from the movie into the Marvel Universe by letting them interact with Aaron Stack the Machine Man. The canonicity of this was dubious for years, but confirmed in the last issue of Machine Man's 1990's series, X-51, where it turns out that the Monolith aliens are, in fact, Marvel's Celestials. The first New Mutants annual featured an abandoned spacecraft the size of the inner solar system. It was also programmed to self-destruct. In a This Looks Like a Job for Aquaman moment, the only hope of averting the self-destruction was Cypher, a kid whose mutant power consisted entirely of the ability to learn new languages quickly. The Homeworld of the Evrons in Paperinik New Adventures: they turn it into a spaceship. They also have "smaller" spaceship to supervise the conquest of other planets. The Dutch comic book Storm has a trilogy involving "the intruder", a huge cluster of Von-Neumann probes that failed to separate from each other after reproducing. The Talisman from Revolutionaries: a big, mysterious alien obelisk with vaguely-defined mystical powers. Star Trek: The Motion Picture has a cloud-covered super ship called V'Ger (or Vejur). It was built around an old Earth probe named Voyager (no, not that Voyager, but rather a fictional 6th iteration in the real-life Voyager program) and sent back to meet its creator. Lampshaded by Kirk and McCoy. McCoy: Why is any object we don't understand always called a "thing"? Star Trek IV: The Voyage Home has a "Whale Probe" that disables every ship in its path by communicating with them and begins vaporizing Earth's oceans in search of an extinct species. 2001: A Space Odyssey pits a single human up against a giant monolith in orbit around Jupiter. 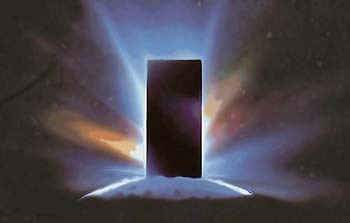 The Monolith serves as an alien teleportation device. Well, you can argue that it also serves as a gigantic computer, an accelerator of human evolution and more or less (at least in the end sequence of the movie) as a total Mind Screw machine. The monolith is best described as a "cosmic Swiss Army knife." It's capable of doing essentially anything required of it. And there are more than just one... and each is capable of self-replication... 2010 ends with a whole fleet of them turning Jupiter into a second sun to kickstart evolution on Europa. The Event Horizon from the film of the same name is a large ship stranded in a planet's upper atmosphere containing horrors and secrets. On the other hand, it was human-made. But it's also been to places man was not meant to be, and was changed by it. The Sci-Fi Channel original film Epoch starts with a huge spinning alien object popping up from underground in Bhutan. As an added bonus, the Torus (as it's labelled) heals everyone in the vicinity, including mortal wounds. It turns out that the Torus is responsible for the evolution of life on Earth. By "responsible", it means that if it perceives that the experiments has reached a dead end, it will "wipe the slate clean" and start over. It had already done that once. The sequel, Epoch Evolution introduces two more Toruses (Tori?). One is identical to the first one, and one that looks the same but kills anyone in the vicinity. Forbidden Planet. The vast self-maintaining Underground City of the Krell qualifies. Standing in one of the huge ventilation shafts, Dr. Morbius says that the platform they're standing on runs for twenty miles in either direction, and there's 7800 levels above them. And there's 400 other shafts like it. The Jokers in The Dark Side of the Sun and the predecessor species from Strata (both by Terry Pratchett) had a hobby of building Big Dumb Objects. The Jokers built probably the biggest, dumbest object of all, which was a chain-link star system made with (as far as humans and other remaining species can tell) a complete disregard for the laws of physics. 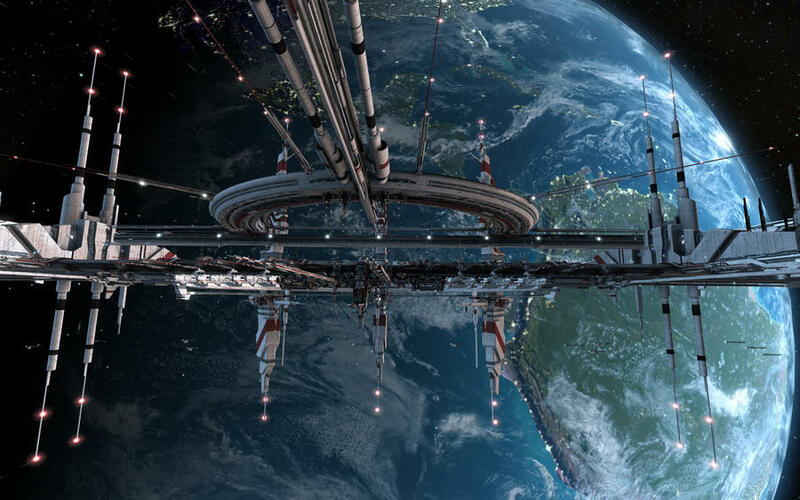 Ringworld is probably science fiction's most famous Big Dumb Object. It is a habitable Ring World Planet the size of Earth's orbit circling a sunlike star. The original builders were decimated and forced to live in primitive tribes scattered across the ring's inner surface. Rainbow Mars features a tree large enough to conceivably be used as a space elevator. Turns out to be a very, very bad thing to have on your planet though, as it literally requires the entire planet's water supply to survive. Niven's article "Bigger than Worlds" considers some possible Really Freaking Big artificial structures. One of them is a disc of superdense matter with a small hole in the middle. The disc's density means that gravity pulls things toward its surface on either side. In the middle of the hole is a star, which oscillates back and forth through the hole to provide "day" (although from the disc's surface it's more like "twilight") and "night". Another is a hollow tube, many light years in length, which weaves between star systems like spaghetti and is flexible enoughnote which, if you do the math, turns out to be a pretty low barrier that its interior can rotate to provide Centrifugal Gravity. It's effectively a Ringworld that's indefinitely stretched along its horizontal axis. The eponymous object in Arthur C. Clarke's Rendezvous with Rama is an alien ship fifty kilometers long which comes zipping into the Sol System. It is seemingly abandoned but eventually slingshots around the Sun and disappears back into space, basically using the sun as a refueling stop. Stephen Baxter's Xeelee Sequence novels feature an object called "Bolder's Ring" (or just, "The Ring") built by the eponymous aliens; it's constructed out of the remains of galaxies. It's a cosmic string - essentially a black hole that has been stretched into a one-dimensional loop millions of light years in length. In the series it is explained to be the cause of the Real Life "Great Attractor" . At its center? The sheer torque on spacetime from the gravity of the Ring tears a hole in the fabric of the universe, creating a portal to alternate universes. Also, the "Sugar Lump" from the same series - a perfect cube the size (and mass) of a small moon. A character walking across one notes that as you walk toward one of the corners, the flat "ground" under you increasingly seems to tilt until it seems like you're walking up a 45 degree incline. Once you reach the edge the gravity makes it feel like you're on top of a mountain sloping down on all sides. John C. Wright's Count to the Eschaton novels features an object called "Eschaton Directional Engine" build by multiple ancient Super Clusters Intelligence. It's Wright's version of Real Life "Great Attractor" . The purpose of Eschaton Directional Engine is to determine the fate of the universe at the Heat Death. It will either bend spacetime positively, into a sphere, or negatively, into a potato-chip shape. Lots of these in Iain M. Banks' The Culture series. The Excession from the novel of the same name is probably the purest example of this trope in Banks' work. In Look to Windward we see Airspheres, planet-sized bubble-like artificial habitats with no internal gravity and filled with air (and bizarre airborne lifeforms) built by a long-vanished race for reasons unknown. They double as Worlds In The Sky. Much of Matter is set on a Shellworld, which is an artificial planet consisting of multiple hollow concentric spheres. Each internal sphere consists of a different discrete planetary habitat. We are told that there are thousands of Shellworlds and that they were built by a long-vanished race for possibly nefarious purposes. They also have a nasty habit of killing their inhabitants, though nobody has worked out what triggers them to do this. We also see a Nestworld, a vast Topopolis -like structure surrounding a star built by a contemporary neighbouring race of the Culture; we are told just this one Nestworld is home to 40 trillion beings, which is more than the entire Culture combined. in Simon Ing's Hot Head a cluster of Von Neumann machines mining the Jupiter system go cancerous. The result is the Massive: it's growing exponentially and heading for the richer pickings of Earth. This is a classic Dumb Object: a gigantic mouth on the move. Ironically it's also anything but dumb: behind the mouth is a lump of computing substrate the size of a small moon. It's got so much virtual reality real-estate that the real world it is gobbling up is simply being overlooked. The Dragon Rises by Adrienne Martine-Barnes mentions Precursors who'd become known as "Gamesters" because among their artifacts was a scattering, on many worlds, of huge cubes, purpose and makeup unknown, which resembled dice right down to having dots marked on the sides. The Gamesters also built warships some of which, despite being millennia old, were still capable of wiping out substantial battle fleets all by their lonesome. The eponymous cube in Risto Isomäki's Xanadu-kuutio ("The Xanadu Cube") is a strange hollow cubical device that is Bigger on the Inside — so big, in fact, that its internal volume is apparently several times that of the rest of the universe. Most artefacts and monuments left behind by already extinct alien civilizations in Alastair Reynolds' works (particularly the Revelation Space series). Troika has the Matryoshka - a enormous spherical object that suddenly popped up into the solar system in the near future, made up of several concentric spherical layers. The outermost layer is made of up of debris being held together by field lines - which will slice anything apart upon contact. Fundamental physical laws begin to break down or diverge as one gets closer to the center of the sphere - such as Planck's Constant becoming larger. And the entire structure is pulsing to the rhythm of the Soviet anthem, as it is a structure sent back in time by humanity to warn itself of imminent danger. The sphere in Sphere. Most of the book is spent figuring out what is does. It makes things you imagine real; the characters suspect that this is an incidental byproduct of an unknown main function. Robert Reed's Great Ship universe has the... Great Ship. It is a ship the size of Jupiter, made of the highest grade hyperfiber. Discovered streaking towards the Milky Way at a third the speed of light by a human built probe, its origin is unknown (the area behind it is the emptiest part of the visible universe), it carries an entire world inside it, and it has tens of millions of caverns and fusion reactors all there to make the interior livable for almost any species. It may be as old as the universe, and one character suggested that it created the universe, or functions as a control center for it - the visible universe simply being another layer to the ship's hull. The Arch in Spin. Technically, it's a circle, not an arch, but it's halfway underground. Sister Alice has Sister Alice's Dyson cylinder in the Brother Perfect chapter, an enormous hollow habitat totally enclosing a star. The cylinder is made mostly out of dark matter with a sprinkling of baryonic matter, causing to appear simply as an oddly shaped Oort cloud around the star unless one knows what to look for. The life on the habitat is similar to plankton, made mostly of dark matter, and lives at a balmy temperature slightly above the freezing point of liquid helium. The Omega Clouds, known as the "Engines of God" in the alien legends that first put humanity on to them, are planet-sized organized clouds of unknown nature which sweep through the galaxy in waves approximately every 8,000 years, destroying obvious signs of civilization. They seem to be primarily attracted to right angles. One now-extinct race went around building fake cities with lots of right angles on various uninhabited moons to try and distract them. The next wave is expected to reach Earth in about a thousand years. The giant alien ship known as the chindi in the novel Chindi, which is discovered refueling itself in orbit around a gas giant in a remote system. In Michael Flynn's The January Dancer, January and his crew find an underground hoard of such objects — all unmovable except the Dancer. The Sobornost gubernyas in The Quantum Thief-trilogy are diamonoid pseudospheres 10,000 kilometres across that act as the central brains of the Sobornost mind upload collective. Each has the face of their dominant Founder intricately carved on their surface. They are made of matter mined from the Sun and when they need to leave their orbits they use collapsing miniature black holes for propulsion, shooting streams of Hawking radiation across the entire Solar System and cause massive gravitational disturbances in all the planets they come close. The Doctor Who  Expanded Universe contains occasional mentions of an object called The Needle , a former TARDIS which got caught in a black hole and became an object a light-year across with one end sticking out of said black hole, on which people eventually took up living. There's also the Artefact, a giant traveling ecosystem of parasitic lifeforms from the novel "Parasite." In The Death Gate Cycle, Pryan is a fantasy version of a Dyson sphere. There's also the Kicksey-Winsey, a bizarre Ancient Artifact which mystifies the Gegs who inhabit (and worship) it. The entire setting is also arguably a single interplanar example, with the odd difference that the Precursor race, the Sartans, nearly wiped themselves out in a magical accident and so never got around to turning the thing on. The Ship in Bryan Reynolds' novella "Ker-Plop" isn't all that big, being only roughly the size of a planet. However, it's constructed as a series of concentric shells, and therefore contains roughly as much habitable area ... and consequently as many inhabitants ... as the rest of the human-inhabited galaxy combined. The Doomsday Machine can chop planets into rubble with an anti-proton beam and use the chunks as fuel. Its hull material is derived from neutron stars somehow. The Fesarius is a sphere ship a mile in diameter that contains a crew of only one and is used primarily as a bluff. The generational ship Yonada is disguised as a giant asteroid. Its crew doesn't know they are on a ship and would not be told until they disembark on their destination planet. The Kalandans built artificial planets as outposts. The crew discover one in That Which Survives. Scotty is found by the Enterprise D marooned on the surface of an abandoned Dyson Sphere that is still programmed to draw ships into its docking bay with a powerful tractor beam. The Dyson Sphere is abandoned because conditions inside have become very dangerous. The Expanded Universe strongly implied that the builders of the Dyson Sphere went on to become the Borg. Tin Man is a sentient biological ship that's been stranded for thousands of years without a crew. Both the Federation and Romulans want access to it, but only a powerful telepath can operate it. It is attempting suicide by supernova due to loneliness, having not had a crew in forever. A rather terrifying sort of existence, if you think about it. The original Borg Cube is a semi-mindless killing machine looking for technology to assimilate with itself. The Caretaker's Array is a giant space station whose technology is all but forgotten by those that made it. It can power a planet and transport ships from tens of thousands of lightyears away. There are 2 of them, by the way. Delphic Expanse spheres were moon-sized devices that could create spatial anomalies when networked together. Blake's 7 featured not one, not two, but three Artificial Planets: Crandor, home of the Thaarn; Ultraworld; and Terminal (first called an "artificial planet," later called an "artificially modified planet"). Warhammer 40,000 has Space Hulks, large mashups of starships that will occasionally drop out of the Warp in orbit around a planet at random. While the Space Hulks themselves (usually) aren't a threat, they can serve as hideaways for Orks, Daemons, Chaos Marines or Genestealers, and on one occasion the tattered remnants of a renegade Space Marine chapter. Necron Monoliths are a lesser version of this trope, having some cooling vents, weapon emplacements, and identifying glyphs. They're still BIG (almost a foot tall in real life, and over ten meters tall in-universe) and far more advanced than anything humans have access to. The title ship in Alternity's Star*Drive setting adventure "The Last Warhulk". The setting of Numenera takes place After the End (actually after eight ends) of advanced civilization and is thus littered with big mysterious objects left behind by the previous civilizations. Eclipse Phase has a couple of these, most notably Olaf (an apparently deserted Dyson sphere). There's also an apparently abandoned, presumably Titan-built Matryoshka brain in the outer Sol system. The Red Star in BIONICLE, until it was revealed to be a Space Station whose crew have almost completely lost contact with the Matoran Universe 100 000 years ago due to a malfunction. Dead inhabitants of the MU were supposed to be recreated and sent back from there, but since only the first step of that process worked, the crew (mysterious beings called Kestora) began doing horrible experiments to the reborn beings to find out why they remained stuck there. The HUB in the X-Universe. A hollow sphere 60 kilometers in diameter, orbiting a red giant and extracting power directly from the sun's core, capable of modifying the Portal Network that links all the solar systems together. The builders are (likely) the same race who built said Portal Network. In a rare example of a human built Big Dumb Object, there's the Terran's Torus Aeternal ◊, which is a massive battle station that wraps along Earth's equator, which houses millions of people, produces part of the Terran's massive fleet (which is in orbit behind it), and has weapons large enough to blast anything and everything that gets close enough in a single shot. Destiny: The Traveler is a mysterious city-sized sphere that kickstarted humanity's Golden Age and created the Ghosts and Guardians as a last line of defense against the Darkness. Oryx's Dreadnaught is a several-thousand-kilometer-long rectangular prism currently stuck orbiting Saturn. He carved it out of a single segment of a worm-shaped Eldritch Abomination eons before the Earth was formed, and used it to house his personal Pocket Dimension, which he everted into realspace in a ploy to make himself harder to kill. The Halo rings are superweapons capable of destroying all sentient life in the galaxy; they were built to stop the Flood from spreading. 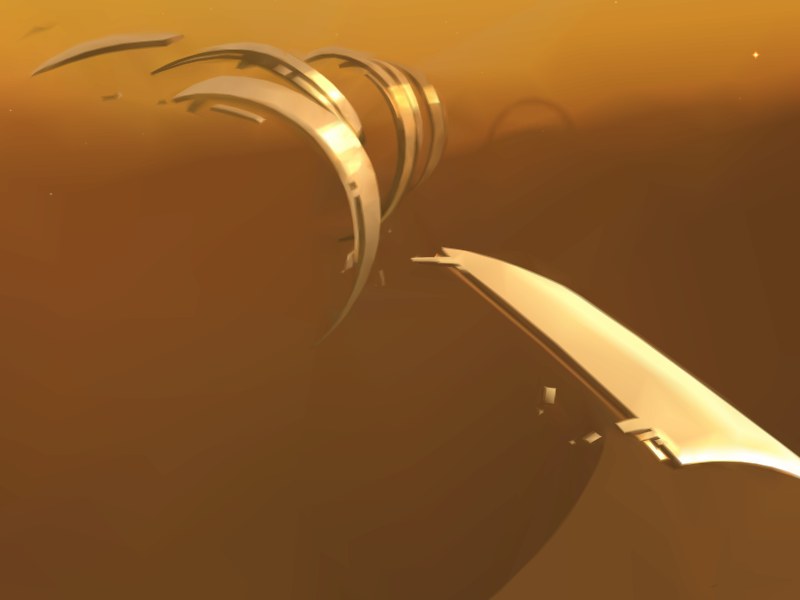 Halo 3 introduces "The Ark", an even bigger even dumber object that can build Halo rings inside of itself very rapidly by a completely automated process and then teleport them directly wherever they're supposed to go. It's also built outside of the Milky Way so that people could hide out there while the Halos kill all life in the galaxy. The novels also introduce Shield Worlds, Dyson Spheres designed to protect anyone inside from the Flood and the Halos. For some reason, the Forerunners were not able to make use of them. The Shield World in Halo: Ghosts of Onyx is even hidden in slipspace, which also creates a Time Dilation effect for those inside it. The final arc of Halo Wars is fought within a Shield World. Almost the entirety of Halo 4 is fought within Requiem, the first Shield World ever built. Infocom's Interactive Fiction game Starcross is about the player discovering and exploring one of these. The Mass Relays, giant space constructs believed to be left behind by the Precursors. While they are the definite means of interstellar travel for the humans and other races, they are also part of the Abusive Precursors' omnicidal plans. The Citadel station applies as well. The Prothean Beacons, which can range in size from slightly taller than a human to nearly a hundred feet. The Crucible at the end of Mass Effect 3 arguably counts. Especially since it's barely explained how it works. The eponymous object in Rama, is an alien ship fifty kilometers long which comes zipping into the Sol System. The Star Trek: The Next Generation game A Final Unity has the eponymous Unity Device, which has all the earmarks of one of these. It's actually a Dyson Sphere created by the Chodak to hold their vast galactic empire together by manipulating the very fabric of reality; it has the power not only to destroy an entire fleet, but to eliminate or create an entire species. A group of Chodak rebels, worried about the damage being done to reality, gained control of it and disappeared along with the device itself. When the rebels bonded with it, it ceased to be a Big Dumb Object and became a living one. At the game's best ending, Picard chooses not to wield its massive power to destroy the Borg, and it vanishes again to continue its peaceful mission of repairing rifts in the space-time continuum. The entire Xenosaga trilogy's main plot is driven by the Zohar. Shores of Hazeron has the Ringworlds, massive ringworlds left behind by unknown objects. These are fully colonizable and can have multiple cities. The Yggdrasil is this in every Etrian Odyssey game. Strike Suit Zero has the Relic, a massive alien superweapon found by the Colonials before the start of the game. Its full power can obliterate entire planets, cracking them open and leaving the rest in a perpetual inferno... and it's headed for Earth. To make things more complicated, the ship had a mind of its own, that's trying to reunite with its body. Homeworld visits the Karos Graveyard several times, a huge area where old derelict ships are stored. In nearly every background shot, there are positively titanic plates and hull sections off in the distance ◊. What they could have belonged to, and who could have possibly built such structures, is never explored. Q.U.B.E. 's Amnesiac Hero protagonist is supposedly on a strange cube-shaped one of these, trying to save Earth from being hit by it... but someone then then claims that this story is a lie and that they're all actually in an Elaborate Underground Base. Uncertainty as to which story is true persists until the end of the game. The Leviathans Story Pack DLC in Stellaris adds a number of these as potential encounters in star systems, ranging from automated warships still patrolling long after the civilizations that built them have crumbled, to a massive sphere orbiting a black hole that's actually a computer using the gravity fluctuations for complex calculations. The Enigmatic Fortress is a particularly curious case: so far as both the Curators and your own archaeologists can tell, it was constructed as some sort of bizarre, esoteric prank to confound future generations of explorers. The mysterious giant cone in The Inexplicable Adventures of Bob!. The caption in its first appearance explicitly compares it to Arthur C. Clarke's Rama. Cans full of sky, balloons full of star, and rogue artificial planets full of death. They're not dumb, but poking them to see how they work just might be. In the F'sherl-Ganni language, "Buuthandi" is an abbreviation for what translates to "Expensive and expensive-expensive [expletive] we built." And they've built quite a few of them. Eina-afa, in particular, is a space station just barely small enough for people to comprehend how incredibly big it is. It's basically a giant can big enough to hold planets, originally filled with nothing but sky for a species of hydrogen balloons, but now covered in jungle-like ecosystems. Sorlie: And you're going to use Jumpstar Prime to build a city inside it. Tagon: There's plenty of room. Also, it rains a lot. Kevyn: Tell her about the hurricanes. Orion's Arm has a number of variations. Ranging from the more mundane Dyson Sphere and Banks Orbital, up to unique examples like the Leviathan which is 10 lightyears across, has a mass of over a billion suns, and is on a collision course with the Triangulum Galaxy. Cybertron could be considered a Big Dumb Object, as it is artificial and no one knows who made it or its inhabitants. The Transformers: The Movie's Big Bad, Unicron, spends the first half of the movie as a Big Dumb Object swallowing planets. He shows he is otherwise after transforming into a moon-sized, humanoid robot. In the original Comic Book series, Cybertron was described as a natural planet where naturally-occurring gears and pulleys evolved into sentient mechanical forms. This was later revoked by Retcon, however. The Star Trek: The Animated Series episode "Beyond the Farthest Start" featured an alien podship a mile long and 300 million years old whose pods were exploded from the inside. The ship's insectoid crew left behind only a message warning of an invasive being that forced them to self-destruct rather than bringing it to their homeworld, which the mains take down fairly easily. The same ship (or a very similar one) is a level in the Star Trek: 25th Anniversary point-and-click adventure game. Instead of the invader it is occupied only by the trader called Mudd, who has legally established salvage rights. The cause of its destruction is not discovered, but there are plenty of pirates in the area. Superman: The Animated Series featured a tremendously old alien colossus that landed on Earth and was fed by heat. Its original purpose was as a construction tool. The Megas XLR episode "TV Dinner" featured a planet-sized mobile world that is attracted to electromagnetic signals. There's a hexagon on Saturn roughly twice as wide across as the planet Earth. To comfort the paranoid, the shape has been shown to be a natural phenomenon that is rather common in fluid dynamics. There is a 600 light-years wide frozen ribbon spinning around the center of our galaxy. On Earth, we have many examples stemming from the architectural achievements of ancient civilizations. These objects and the mysteries that have surrounded them might have been the original inspiration for all the other examples of this trope. The pyramids of Ancient Egypt and Mesoamerica. The moai of Easter Island, though they're not actually ancientthe oldest of them are 12th century. The Nazca Lines in Peru. The earthen mounds built by the... um... Mound Builders . The Great Attractor . A supermassive... thing affecting the movement of some galaxies (including the Milky Way). Currently it's believed to be a pair of large galaxy clusters that are difficult to see due to our view being blocked by the rest of the Milky Way, but for that very reason that region of space is difficult to study in detail. More details here . See also the Dark flow , something claimed by some scientists to exist far beyond the edge of the observable Universe and said to be able to pull entire clusters of galaxies. The stone spheres of Costa Rica . Something is blocking the light of KIC 8462852 in a bizarre irregular pattern, very unlike the regular, periodic pattern seen with transiting planets, and so much light, it has to be at least half the diameter of the star itself. The researchers think it's most likely a swarm of cometsnote though even they admit it's a low probability but... maybe not. 'Oumuamua , a highly elongated battleship-sized asteroid (we think) that came from interstellar space and is passing through the Solar System -the first of its kind discovered- and it's moving so fast respect to the Sun that a mission for reaching it with an (unmanned) probe would give a good run for its money to our current propulsion technology. Comparisons with Rendezvous with Rama ensued.